Recently, Eric Herod sat down virtually with wedding makeup artish Jeet Bahra, and to be sure, Bahra shared a lot of great makeup tips. You can see for yourself what a talented makeup artist she is. But most of what Bahra has to say transcended makeup and evinced a humanity and a level of wiseness not seen enough in wedding professionals today. That’s one way to keep a client at ease. Another way is to take care of the crucial details before the wedding. In this way, she can help the bride relax in ways that go beyond her job description but speak to her affability. 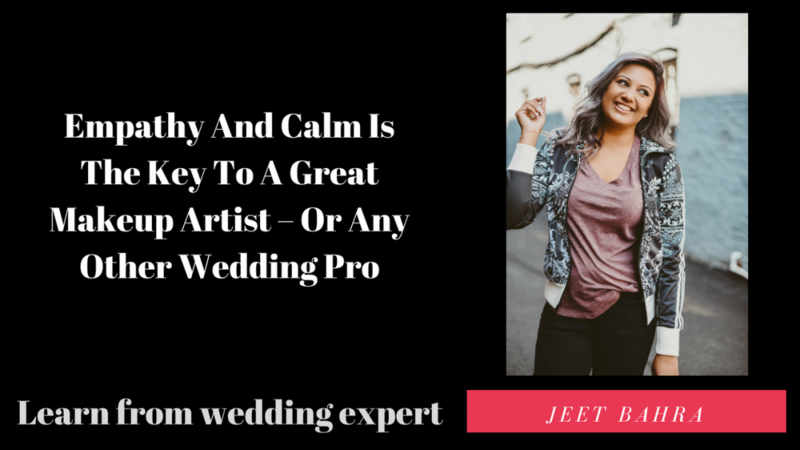 In short, Bahra says, “I have a knack for being sort of like a calm intermediate while other thing that’s going on, so that kind of helps me,” and that’s something you should be looking for from ALL of the wedding professionals you hire, not just the makeup artists. If this skill comes naturally to the professional, so much the better. But y’know, since she is a makeup artist par excellence, you do want some makeup related tips from Bahra, I got you. *Pinterest, with Instagram a close second, is the best resource for finding examples of the makeup look you may want. Their popularity means you can search and find anything on these sites, no matter how specific. *To keep your skin looking its best, drink lots of water, put on moisturizer in the morning and at night (the morning version should be SPF moisturizer), and don’t get a facial done before the wedding – they bring flaws to the surface. *Search for makeup artists by skill set rather than by price. If you want a makeup artist that can do killer wings, and you hire the cheapest makeup artist who, it turns out, doesn’t know how to do wings, you’re up a creek. *Pass along to your makeup artist the portfolio of the photographer you have chosen. The photographer’s preferred shooting style, particularly as it pertains to lighting, has a big impact on the proper way to do your makeup. All of this is important. But the most important thing is a wedding pro who is actually interested in you and what you have to say. Bahra understands this. Want more tips on how to make your wedding something the guests will talk about for years, sign up for your FREE copy of 3 Things You’re DJ won’t tell you about how to take your wedding from average to Legendary! Schedule Your Legendary Wedding Consultation.